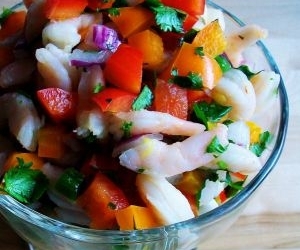 Shrimp Ceviche is a Peruvian food recipe marinated in tomatoes and peppers with citrus juices. Place the shrimp in boiling water for 1 minute or until pink then put in ice bath, cool and drain. Place next 10 ingredients in blender and liquefy. Pour over shrimp and marinate shrimp for at least one hour. Toss with onions, chives, tomato and cilantro and serve on lettuce.